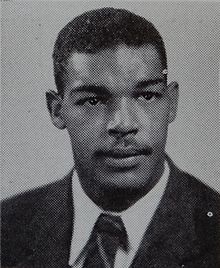 Len Ford was a basketball and football star at the University of Michigan. Ford played professional basketball for just one season, but enjoyed a highly successful ten-year professional football career. He spent two years with the Los Angeles Dons of the All American Football Conference. He played for the Cleveland Browns for the next seven seasons and then finished his career with one season in Green Bay. In 1976, Ford was elected tho the Pro Football Hall of Fame.